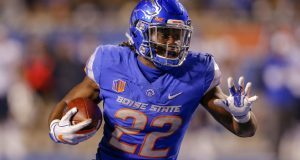 Your top five rookie running backs may be different than mine, and that’s ok. The Iowa State running back was my #1 before the combine and showed to be exactly what I thought he was. Montgomery is a tough runner with a nice jump cut and good vision. 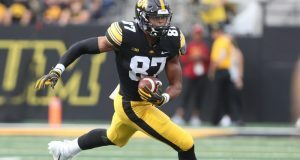 At 5’10’ 222 pounds Montgomery plays faster than the 4.63 forty he ran at the combine but long speed has never been his game. Montgomery grabbed the starting role as a sophomore and ran for back to back 1000-yard season while catching 58 passes. A willing blocker who has a reputation as a team leader and very hard worker. In this clip, Montgomery sees the hole close and bounces outside for a first down. New head coach Brian Flores spent his entire fourteen-year coaching career with the New England Patriots and Bill Belichick, along with Flores came ten-year New England veteran Chad O’Shea as the offensive coordinator. With dynamic play maker Kenyan Drake in place, Montgomery looks like a natural fit along side Drake to provide the thunder to Drake’s lightning. Spending a third-round pick on a work horse quality back with high character gets the Dolphins makeover off to a great start. Many have the Alabama back perched atop their running back rankings and rightfully so. Blessed with three down size Jacobs can handle the early down work between the tackles and showed ability to catch the ball while sharing the load in a crowded backfield. The biggest concern for me was the fact that Jacobs could not garner a larger share of the touches at Alabama, though he did perform well in a pass catching role with 48 catches in three years. On this touchdown run Jacobs shows his ability to maneuver in traffic and finishes strong to the endzone. The Eagles currently have a backfield loaded with maybes, you know, a bunch of guys that may be consistently good running backs. Clement, Smallwood, Adams, recently acquired Howard and a well past his prime Sproles don’t really strike fear into defenses. Doug Pederson has shown the ability to get the most out of his running backs but has not had a back who can bring it all together in one package, that back is Josh Jacobs. Jacobs can immediately put a claim to the top spot should he slip past the Raiders. Running behind that solid Philadelphia offensive line would make for a nice rookie season. Jacobs will not be available when the Eagles pick in the second so barring a trade up the Eagles will need to grab Jacobs with pick 25. The Penn State alum has started to rise up draft boards and is settling is as a top three to five running back. After backing up Saquon Barkley for two years Sanders earned the starting role and ran for 1274 yards and caught 24 passes. Blessed with good vision and instincts Sanders can make the quick cut and is powerful enough to break tackles. This clip shows Sanders making a move in the hole and bouncing outside and finishing strong. Buffalo is at the beginning of a rebuild and the Bills have a running back room on the back side of 30. Adding Miles Sanders as the heir to Shady McCoy, maybe sooner than later, at pick 112 makes a lot of sense. Sanders showed his mental fortitude when he stayed at Penn State despite lack of playing time behind Barkley, this Buffalo team will need leaders like this. Speedy back with a sturdy build packing 203 pounds on his 5’8 ½” frame Henderson rushed for over 3500 yards and caught more than 60 passes in his three years at Memphis capped off by 1909 yards and 22 touchdowns in his junior year. One of the most explosive runners in the draft, Henderson generates power with his low center of gravity and constant leg drive. On this touchdown vs UCF, Henderson shows his vision to see the hole and cut back to the open field. He has the juice to take it to the endzone once he gets to the second level. Houston has incumbent Lamar Miller and third year power back D’Onta Foreman atop the depth chart and could use a youth infusion. Miller is 27 and his best years are behind him, Foreman is finally back from the achilles tear his rookie year setting the stage for Henderson to take over as the lead back by the end of his rookie season. If it weren’t for injuries Rodney Anderson would be the top running back in this class in my opinion. 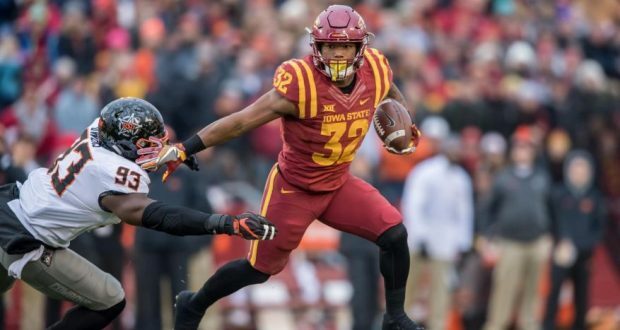 After averaging 6.2 yards per carry for 1161 yards during his redshirt sophomore year Anderson was poised to build on that breakout during his RS junior year. Runs with good vision and patience and shows a nice feel for moving through traffic. You see Anderson in this clip make a cut in the hole, get to the second level and show the speed to get to the endzone.